I’ve finally managed to finish the birth announcement cross stitch I’ve been working on for a friend’s baby. Phew! Relief! About time too – this child could arrive any day now!I was starting to worry that it would end up being like the picture a stitched for some friends of mine’s wedding, which I ended up sending to them after they came back from their honeymoon as I wasn’t finished any sooner than that! Check it out! All I need to do now is insert the name and date of birth in the sce within the cloud, which I obviously can’t do until I have that information. 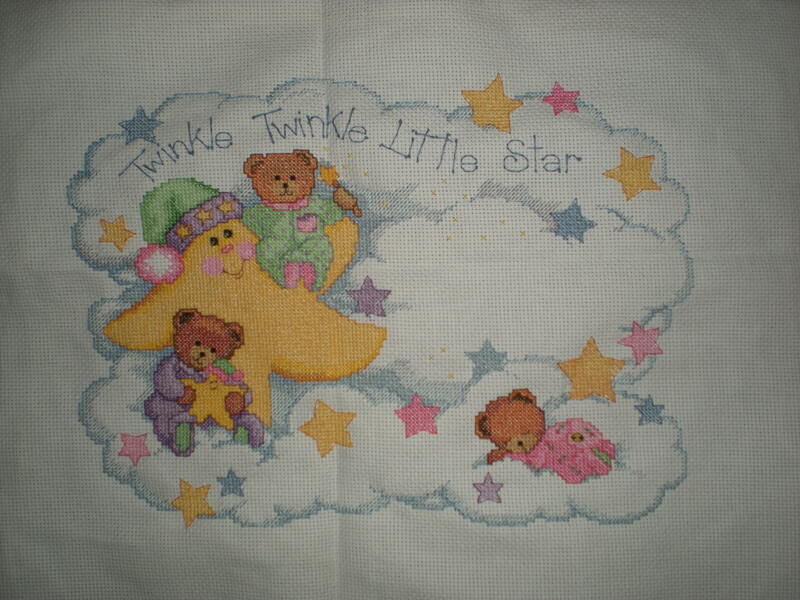 I’m actually incredibly proud of myself for managing to do all the French knots on the Twinkle, Twinkle, Little Star. I absolutely hate the things. I also received word today that the gift I sent for my cousin’s baby girl (born on 5 January) arrived. I sent it over a week ago so was starting to wonder… don’t trust Deutsche Post or Royal Mail as far as I can throw them, and when both are involved anything could happen! I haven’t been able to blog in ages. I had a crazily busy evil monster of a week during which I managed to work three hours of overtime despite leaving two hours early on the Friday to catch a flight… or rather two flights becuase there aren’t any direct ones from here to Newcastle. This was followed by a week in England that was equally as busy, but filled with much nicer things than customer demands and looming deadlines. The main reason we flew to England was for a friend’s wedding, which my sister had previously been referring to as “the wedding of the century”. She had a point! the planning seemed to have been going on for decades. It’s going to be strange not having the regular Facebook updates now it’s all over! The bride even asked me last year whether I would absolutely, definitely 100% be attending – something I couldn’t promise that far in advance! And my sister was chief bridesmaid so she was right in the thick of it… going to wedding fairs, arranging hen nights (yes, plural!) and generally running round like a loon. I think it was all worth it though. The big day went off with no major glitches, the bride looked absolutley beautiful (as did the bridesmaids) and the couple looked happy enough to burst. It must be nice to know that you’ve found the love of your life and that they actually feel the same way too. The reception was held at The Vermont Hotel, in Newcastle – rather posh with four stars! it’s right next to the Castle Keep (all that remains of the castle that gave the city its name) so some beautiful photos were taken there. Lunch – if you can even still call a meal that isn’t served til 4pm lunch! – was roast pork with crackling which I adore and which did not disappoint – it was delicious! As was the chocolate brownie that followed it. The buffet at the evening reception, on the other hand, was a letdown – although the chocolate fountain made up for it. All in all, a good time was had by all. Including the most important people – the bride and groom. I know I promised to blog more after I received my prolific blogger award, and I’ve been meaning to post for nearly two weeks, but as you can tell I’ve failed utterly miserably. I just don’t have time to blog. Between all the overtime I’ve been doing lately (so many big jobs, so little time), the course I’m doing on Saturday mornings (10 finger typing course, bot interesting enough to write about) and all the usual cooking, attempting to spend time with my boyfriend and occasionally actually cleaning the flat, my poor blog just hasn’t had a chance. Sigh. Soo, I’ve just found out a girl I used to be pretty good friends with, and whose family are friends of my family, is pregnant. Another one to add to the list. Currently I only know three people who are expecting, the fewest it’s been for a while. And another friend got married last week (an ex-boyfriend as it happens), which necessiated the sending of a gift to England. All these babies and weddings are going to bankrupt me! Baby clothes are so cute though, and it’s not like I’m going to be able to buy any for a child of my own for a while… or possibly ever, so there is a silver lining I suppose. So while all my friends are moving in together, buying houses, getting engaged, exchanging vows and having babies the two of us have moved out of our student residence and got our first flats separately, attended engagement parties and weddings as “boyfriend and girlfriend” (in what seems to me is the same sense of boyfriend and girlfriend that is uttered by 15 year olds) and bought dozens of gifts for other people’s children. It’s not like I even want to get married and have babies at this stage in my life. I don’t even particularly want to get engaged yet. But it would be nice to feel like some day it might be my turn. What I would like is for us to get a flat together. I mean, I adore my flat, it’s the first place I’ve ever lived that was truly mine and it really is a nice place but only being able to have my boyfriend with my for some of the time… well, it gets a little lonely sometimes. I want to be able to wake up beside him every day (not just when he happens to be staying at mine). I want to know I’ll see him in the evening without having to ask. 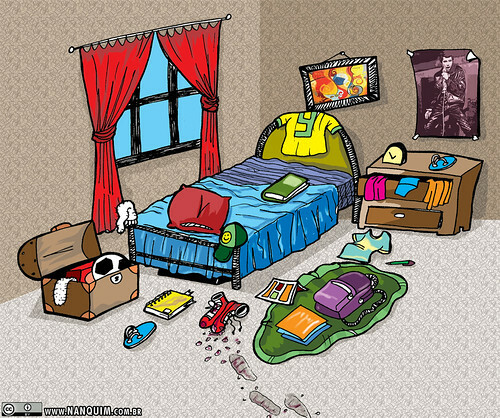 I want a bed that’s not mine, but ours. Is that really too much to ask? Sometimes I’ll find myself trying to work out reasons why he might not want to live with me, despite the fact that he tells me he dosn’t even know why. But it’s as if I need to have a cause so I can start trying to fix it. A while ago I got the idea into my head that once I had a proper job he would want to stay with me. Except then I found a proper job, moved into a flat (by myself), lost my proper job again and found a new one… and I’m still living alone. Now I occasionally think that maybe once I’ve got through my probation period things might start to happen. Then there was the time that I decided I needed to give him a reason to come home to me every night, so I started making sure tea was ready when he came home and he always had something clean to wear. He tells me he likes cooking with me though, so I guess that one’s backfired. A recurring theme (and something that I guess is always is that back of my mind) is thinking that he doesn’t want to live with me because he’s seen the state that my flat gets into, so every few months I’ll make a vow to myself to keep on top of the housework. Unfortunately, as I keep telling you (I am the proverbial stuck record!) my housewifely skills leave much to be desired. So I’ll clean and tidy the entire flat once and manage to wash the dishes immediately after we eat for maybe three days in a row, but then I get bored and the thought of the dishes waiting for me in the kitchen just makes me want to cry, and so I stop and once again Jan has to come home to a messy kitchen once again. In my more logical moments I realise that whether he wants to live with me or not doesn’t depend on my job or my cooking or how tidy I am, but my logical moments are few and far between. Before long the crazy catches up with me again and I start obsessively cleaning the kitchen and dreaming up new and interesting dishes to win over my man’s heart (because we all know the way to that is through the stomach). And so it goes on, over and over again. … and of course number 10 is the new one. Named Beau in case anyone was wondering. It’s not over yet either. A girl from my building was supposed to have her baby on 8th November. As far as I know it hasn’t arrived yet. When it does that will be 11 babies. Eleven! Is it just me or is that a lot? I’m just glad I don’t know anybody else who’s due this year, otherwise we’d end up with an average of one baby a month. Scary stuff. I do, however, know three people who are due next year. And considering we still have 13 months until next year is over and a pregnancy only lasts 9 there’s still plenty of time for more announcements. Is this the way it’s going to be for the rest of my life? Yes, I am aware that I blogged just a few hours ago. I’m also aware that my life isn’t so exciting that people will want to read about it several times a day. But I’ve just come back from work 5 hours early. I’ve taken the afternoon of to do a practice translation for a company who I’m hoping will offer me a job. I have an hour and a half to wait before they send me the text to translate and I’m very nervous. I have to blog if only to keep me sane! This is the fifth baby to be born to someone I know this year. Three people I know are still pregnant and due this year. That will be 8 babies. Eight! Just four more and there would be one for every month of the year! Between my relatives, people I went to school with and friends from Germany this is starting to feel like the year of babies.